It might be bang at the heart of a city where you can’t swing a Fendi bag without hitting a luxury hotel, but something about the Raffles Dubai makes you feel like you've discovered a hidden gem upon arrival. 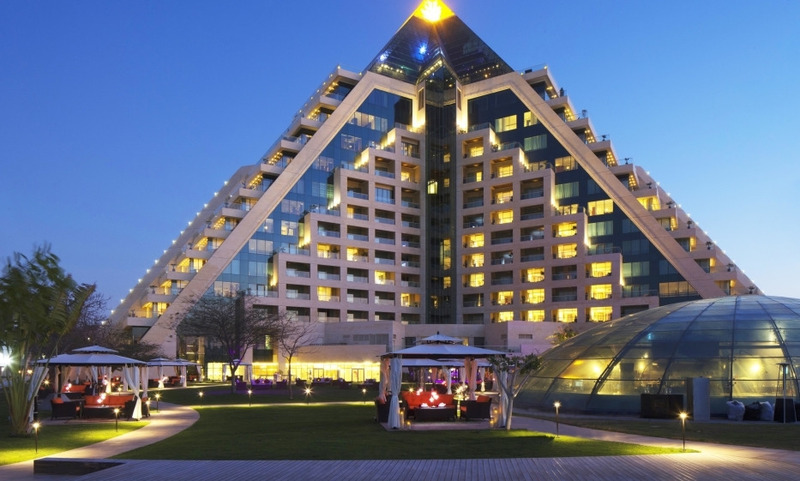 A pyramid-shaped hotel with a unique Egyptian aesthetic, it’s as much an ode to Arabic culture as it is a sanctuary to unwind in the city. You see it in every detail of the hotel, from the hieroglyph-etched pillars of the lobby to the intricate mashrabiya panels and Arabian pendant lights in the rooms. The location of the Raffles Dubai, is unique, connected to the adjacent Wafi Mall with its luxury shops and authentic 14th-century souk. Not that guests who check into the Raffles hotel need to look elsewhere for distractions; there are seven restaurants and bars here and a spa where treatments inspired by Asian and Middle Eastern traditions are as rejuvenating as they come. There is an outdoor pool too, with some of the best views over the city. Pack your espadrilles and wide-brimmed hat for lazy days whiled away on sunloungers and sipping cocktails from the Pool Bar. Superb room size with smallest rooms starting at 70 sqm (753 sq. ft.) ! It's an old dame with dignified presence, and we enjoyed the property and the people. When the butler brings marshmallows for the children with their names in chocolate and even the pool boy remembers your name after the first day while serving you drinks, you know you are in for personalized service, which makes all the difference. Excellent hotel all the way through. In turn, we remember the names of those whom we enjoyed - KC at reception (10/10 especially), Anthony the bell boy, Dheeraj the pool service staff, Joseph @ the concierge, Noor our butler, Kris who manages the club lounge. Amazing. My visit at Raffles Dubai made my business trip feel almost like vacation. The staff was genuinely friendly, breakfast was fresh and delicious and served perfectly my diet and preferences giving also possibility to try some new tastes as well. We had a fantastic stay . The hotel is just perfect , the service is excellent, people are so kind . The room was big, nice terrace, good beds - the breakfast was just awesome, so much choice and so good. The pool area and the pool bar are just heaven . We will be back next year, that's for sure! Quite lovely- very pleased and will be staying again in the spring. We hated to leave. I absolutely loved this hotel. Everything was perfect. We were upgraded and enjoyed the lounge whose staff is extremely courteous and helpful The room was very nice and comfortable. I will return to this hotel on a future trip to Dubai. The staff at the pool, the doorman, the gym instructor and Dhan at housekeeping deserve praise! Raffles Dubai was amazing. Staff were very friendly and obliging. Anthony in particular was fantastic. The best hotel we have ever been to. The best customer service we have ever experienced. We are so happy that we chose Raffles Dubai hotel. A hotel with attentive staff who really love their work. I have seen many good hotels around the world but the spirit of the staff and the friendliness was overwhelming!! I really enjoyed my stay at the Raffles in Dubai, I couldn’t wish for more …. thank you to one and all ! This is an exceptional hotel. I stayed here in May and all the staff remembered my name from this visit and welcomed me back. The staff were very friendly, very welcoming and couldn't do enough to assist us. Even the housekeeper does a very thorough clean of the room each day (approx 45 minutes) showing how much attention to detail is undertaken at this hotel. The breakfast at the restaurant is superb, and the decorations for Ramadan across the hotel were exceptional. Even though it was Ramadan, there were plenty of options for food and drink for tourists within the hotel. As there were less guests, we were given very personalised service. The view from our club room on the 10th floor was breathtaking. We were very pleased with our stay at this hotel, we love the spacious feeling of the rooms and public areas and the friendliness of the staff. We will return here if we stay in Dubai in the future. We had a wonderful time where everything was perfect, thank you for this wonderful moment of happiness. Excellent in all respects. Cannot fault anything. We booked a room with club privileges. The staff in the club room were extremely friendly and noting was too much trouble for them. Overall Raffles Dubai was an extremely comfortable hotel, there was some refurbishment work being undertaken which meant that one of the restaurants was not open, however, this did not adversely affect our overall stay. A wonderful and classy hotel that is close to the airport. The spacious rooms and friendliness of the staff are the standout qualities here. Nice hotel. Good location with good food quality. Maybe a little expensive. The service is very good.